Pool Tournament @ Games Room, Etc. 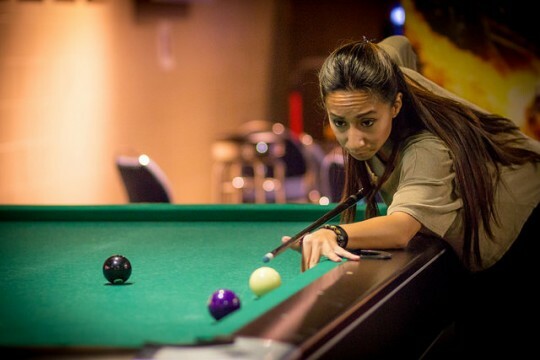 Compete against fellow Bronco billiard masters at this event for FREE. Head to the GRE anytime during the week to sign-up for the tournament. It’s time to gear up for some serious study sessions, Broncos! Associated Students, Inc. (ASI) Student Activities and Programs is proud to announce the Bronco Student Center (BSC, Bldg. 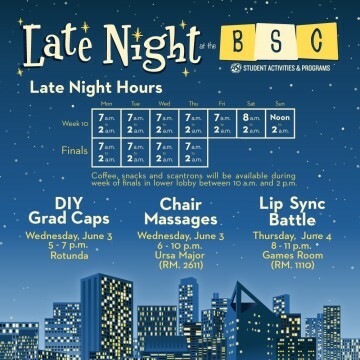 35) Late Night Hours, just in time for finals. 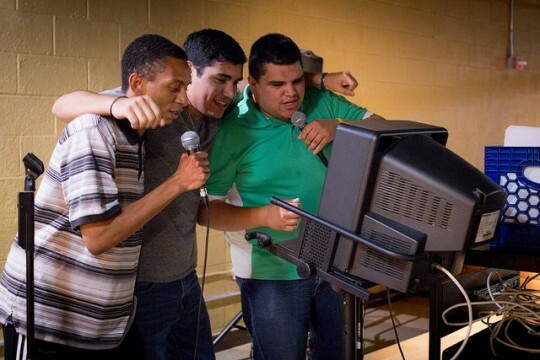 Make your vocal debut on the GRE stage singing your favorite songs! Free pizza will be provided for participants. GRE attendees can also participate in free pool, during the event. No sign-up required! Sign-ups begin on Monday, June 1 at the GRE front counter. Kick the competition for your chance to win box office prizes! Monday, June 8 until Friday, June 12, bring your pals for caffeine and cookies in the morning at the Games Room (GRE, Bldg. 35). 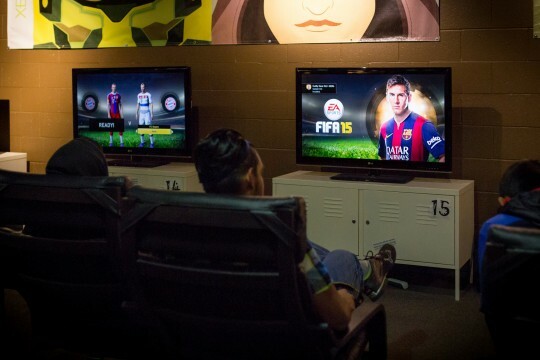 Relax and de-stress with $1 play all day — play pingpong, pool, foosball, X-Box and PlayStation. Are you up for the ultimate racquetball challenge? Associated Students, Inc. (ASI) Campus Recreation is giving you the chance to showcase your racquetball skills with Intramural Sports Racquetball Ladder! For more information, click here. Hip-hop artist B.o.B will be headlining this year’s BroncoFusion concert on Friday, Sept. 25. The concert is free to all students and will begin at 7 p.m. at Bronco Commons. The pool party will be held after the concert at the Bronco Recreation and Intramural Complex (BRIC) from 10 p.m. to midnight. For more information, click here. 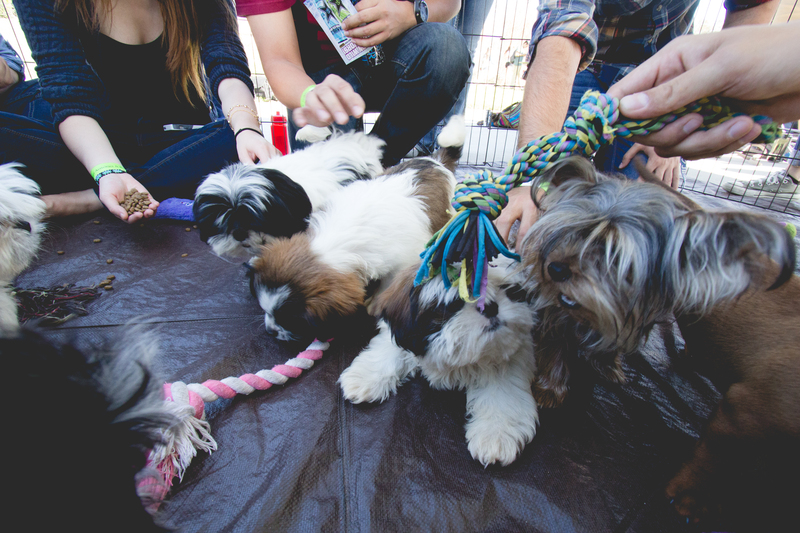 Midterms can be ruff and leave you feeling pawful, but the Bronco Events and Activities Team (BEAT) is here to throw you a bone with Puppies in the Park! On Tuesday, December 1, join BEAT at University Park Stage from noon to 2 p.m.! It’s time to “BEAT” your stress with these cute, cuddly pups. For more information, visit the BEAT website here, call (909) 869-4455 or come to the BSC, BEAT office (Bldg. 35-2114). Dust off those cow boots and flannels – join Associated Students Inc.’s Bronco Events and Activities Team (BEAT) for the ultimate hoedown at Cow Poly Line Dancing on Thursday, Jan. 28 at the Bronco Recreation and Intramural Complex (BRIC) pool deck from 7-10 p.m.
Cow Poly Line Dancing will be a night filled with country music, line dancing with help from an instructor, DIY decorating and more! The event will also feature prizes and free food such as caramel apples, pie and lemonade. For more information, visit BEAT’s website or call (909) 869-4455. For more updates on all ASI events, follow us on Facebook, Twitter and Instagram, and be sure to keep up with our Snapchat @asicpp! Homecoming season is here yet again! Join Cal Poly Pomona (CPP) for Homecoming on Saturday, Feb. 27 from 1 p.m. to midnight at Bronco Commons – located near the Bronco Recreation and Intramural Complex (BRIC). Click here for more information.